Jeff Chambers, a 2008 member of Spokane Thunder, submitted this photo and caption. 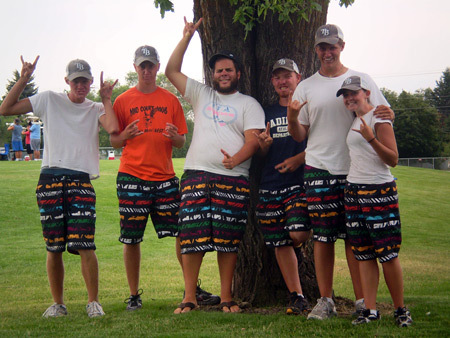 This photo of the Spokane Thunder bass drum section was taken on the last day of the corps' all-day rehearsals in front of what we called the "tree of wisdom" at Centennial Middle School in Spokane, Wash.
From left to right and in order of drum is me, Tanner, Rob (bass staff), Morgan, Corey, and Briann. Rob is making what he calls the "cowboy face" and the rest of us are trying (and failing) to copy him. All summer long Rob would make this face for the bass line whenever we had a good show and we would all laugh at the ridiculousness of it. Our attempts to create the "cowboy face" ourselves was an ongoing task and a fun failure for all of us all summer long!